Relive the classic Alien games with this Pop! Vinyl figure! Features a deco with an orange-and-blue shade effect. Entertainment Earth Exclusive! Funko blended the pixel-art style with its classic Pop! Vinyl silhouette to bring fans a line of 8-bit Pop! Vinyl figures. Take it further with this Pop! featuring an exclusive video game deco with an orange-and-blue shade effect! The Alien Video Game Deco 8-Bit Pop! Vinyl Figure - Entertainment Earth Exclusive measures approximately 3 3/4-inches tall and comes packaged in a window display box. Order yours while you can! 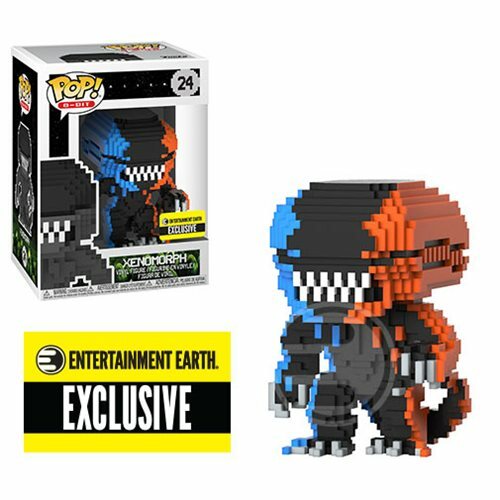 Expand Your 8-Bit Collection with This Entertainment Earth Exclusive Alien Pop!